Oppo N1 Mini, more compact, maintaining a Rotating Camera. Home / News / Oppo N1 Mini, more compact, maintaining a Rotating Camera. Smartphone cameras are a very important feature at the moment of marketing. People love to shoot good pictures, mostly to others or landscapes. In the past months, Selfies are the new style, and front cameras are required to have higher resolutions, with better flashes and lens. This reduces construction quality and elevates price ranges. The Chinese manufacturer Oppo solved this conflict with their flaming Oppo N1 smartphone adding a great idea: a rotating 13 megapixel camera that can be used as front or back camera, when required. All of a sudden, we have a 13MP camera to shoot selfies. What a record. The Oppo N1, porting a Snapdragon 600 and 2GB of RAM is a great smartphone, but incorporates a disadvantage (or advantage depending on your preferences): It is HUGE. It carries a 5.9 inch display which makes it pretty hard to handle in a single hand, or even put in your pocket. This is the main reason why Oppo is about to launch the new Oppo N1 Mini, which is a more compact device with a 5 inch screen, much more convenient to handle. The most interesting fact is that it will maintain the rotating camera, without affecting the size of the phone. 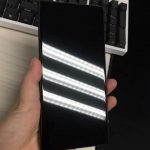 There are no technical specifications for the device yet, but we may assume that the screen reduction, compared to the Oppo N1, will reduce the resolution from 1029×1080 to 1280×720 pixels. Among other things, it will be sold in white, yellow, light blue, pink, and will sport a metallic band that will distinguish it from the bigger bother. Prices are unknown, but it is said to be announced officially on May 30 of this year. Next The new version of Fujinon XF 35mm f/1.4 R with faster autofocus.